Does Green Tea Fight Cancer in Dogs? The benefits of green tea have been long celebrated in human beings, but do those same benefits apply to dogs? The tea, which originates in China and is one of the most popular beverages in the Asian world, has undergone minimal oxidation when it is processed. This abstract from the U.S. National Library of Medicine discusses a study done in Japan on men with prostate cancer and the effects of green tea consumption. The bottom line of the study was that the tea could be linked to a lower risk of advanced stages this type of cancer. For the the men who drank 5 cups of the tea daily, the cancer did not worsen. So, we know that there are lots of health benefits for people who drink green tea, but I wanted to shed some light on why it may be helpful for dogs as well. The main reason for these benefits is the fact that green tea contains antioxidants that boost the immune system for Fido, and a healthy immune system is believed to be the key to both fighting cancer and preventing it. This may make green tea an excellent preventative health tool for fighting cancer in dogs and other diseases and illnesses, before they even have the chance to take hold in your four-legged friend. The main thrust of today’s discussion is the impact that green tea for dogs may have on fighting cancer. There have been some studies to back this up. One study (PDF) involved a seven-year-old Labrador with lymphoma that was given green tea on a daily basis as part of its treatment. The dog was also treated with various antibiotics, including amoxicillin, tetracyclines and Septra, but they had no effect on helping cure the cancer. After considering other treatment options, the owner of the pooch settled on green tea extract and 40 mg of oral prednisone per day. After this regimen was administered, the dog’s condition improved considerably. Enlarged lymph nodes shrunk to “normal size” within the course of five days, while his general health improved greatly. That’s not to say that the health problems stopped for our Labrador friend, but the green tea extract did provide a health effect that cannot be discounted. And 50 weeks after the dog was diagnosed with cancer, he was symptom-free. Was it the green tea? Or, a combination of the green tea and the conventional medicine. I don’t think we can accurately say for sure. Treating cancer in dogs generally involves chemotherapy. This has a number of proven side effects and can generally impact the life of the dog in a negative way by leading to a diminishment in overall quality of life. Choosing green tea extract or some other form of green tea treatment over chemotherapy is doubtlessly a more comfortable and humane treatment for the pooch, but is it as effective? While the aforementioned study is encouraging, there have been no comprehensive studies about the effects of green tea on treating cancer in dogs. It is true that green tea polyphenols such as EGCG have been proven to treat cancer cells and lead to apoptosis, which is the “suicide” of cancerous cells. The trouble here is that dogs will have to ingest an awful lot of green tea in order to get the apoptosis effect. The good news is that there’s no evidence that ingesting large amounts of green tea has any negative effect on a dog, but the bad news is that the best dosages are a little hazy. 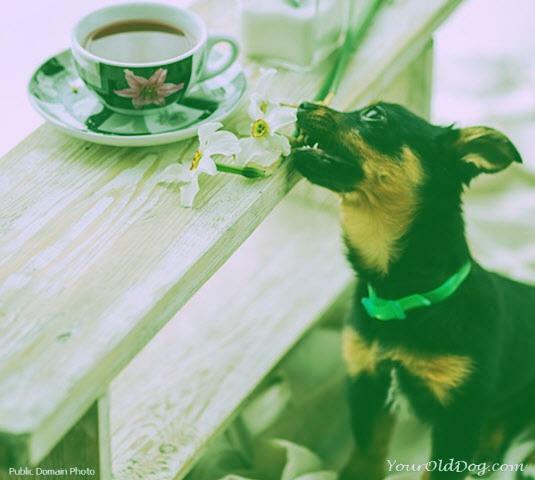 Should you decide to give your dog green tea, make sure that it is DECAFFEINATED! Some recommendations seem to suggest that dogs are best served with a 500 mg per kg dose of green tea. It should be administered on a full stomach and with the recommendation and approval of your veterinarian. As some cancer-fighting drugs can be impacted by green tea extracts, it’s best to ask your holistic vet about any additional therapies you might attempt for your dog. Also, according to Dr. Todd, once Prednisone was stopped in the study, the cancer unfortunately returned.